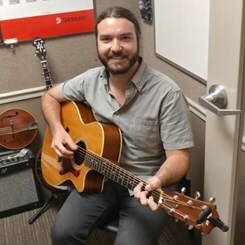 10 years private study, including Summer Jazz Studies at Duquesne University in Pittsburgh, PA. Additional studies in Jazz Guitar Performance at University of the Arts in Philadelphia, PA. Extensive performance experience, including tours in U.S. and Europe with various bands and professionally recorded and released 2 albums. 7 years private and ensemble teaching experience. Request Lessons with Derek Kretzer today!